Ron Wolk had an important role in K-12 education in this country. He helped educators learn from other educators and be involved in conversations around education. Ron’s book, Wasting Minds, is a great summary of Ron’s philosophy. Ron became a Big Picture board member and President of the Big Picture Board. He served as a mentor for Elliot and I over long dinner conversations. As he got older and not as healthy, he kept his connection to us and Big Picture. His mind was always sharp. Also, Ron always complimented our work and supported in in any way he could. Ron was probably the strongest advocate for the start of College Unbound. This encouragement helped me greatly in the early years.We will all miss Ron, his mind, his jokes and his educational leadership. May he rest in peace. I met Ron over 25 years ago and from that time on we became friends and someone I always went to for advice. When Ron first met Dennis and me, he was looking for something that was the real deal that didn’t focus on just a test score but rather on each and every student. He found us and the rest was history. Before Ron came on our board, we traveled together by train to visit a foundation we we're looking to for support of our work. In 15 minutes we walked away with $750,000 for BPL to start developing Public Service Announcements that eventually went on to win an Emmy. Eventually, Ron got more and more involved in the work of The Met and Big Picture. He was with us. He wrote about us and then became the president of our board. His leadership was instrumental in making us who we are today. He gave voice and credibility to our practice like few people out there. Ron had very strong beliefs in justice and democracy and I’m so proud to say we were a part of his life’s work. We all miss and love ya Ron. Not too long ago -- in Education Week, a publication which he founded -- Ron Wolk shared his "Vision for U.S. Schools". In it, he touted Big Picture Learning as a vision -- if not the vision -- for what schools should look like amidst growing calls for a transformation in the U.S. Public School system. "The system I would like to see would be built on a number of intertwined concepts: personalization, out-of-school learning, multiple pathways. It would seek to prepare students to responsible citizens and fulfilled and caring human beings." These were Ron's words around the time that Andrew Frishman and I were transitioning into Big Picture's new Executive Directors. These words helped forge our path forward and continue to define our mission and goals to this day. What is more essential than helping young people become "caring human beings"? Ron's guidance will be missed but not lost. Ron Wolk was a passionate force for good in this world. Although he had unequalled expertise in covering the education system as a journalist , Ron always entered conversations with a learner’s stance. He was perennially interested in gaining new insights and perspectives from those with whom he was connecting. Even in the midst of contentious discussions about finer points of education policy, he was always clear and constructive, seeking to find common ground. Ron was an indefatigable champion of Big Picture Learning over many years. After a long career in education he had decided that the system was never going to get better, so he retired and moved to a quiet house on Narragansett Bay in order to try to get away. But after visiting the Met, he found himself re-inspired and got involved in Big Picture Learning. As Board Chair, he often claimed that BPL kept him invigorated and engaged in education for the last 20+ years. We are so grateful for his invaluable support and express our deepest condolences to his family and loved ones. I've known Ron for almost 20 years, first in my role as the Commissioner of Education that authorized the MET school in RI, and more recently as a fellow Board member of BPL. I knew of Ron as the founder of Education Week, and shared his passion for expanding the public policy discussion concerning the purpose and place of public education as a national interest, and civil right...the "all kids" agenda. But it was in my direct work with Ron, as Commissioner, when he was Chair of BPL, that we shared the conclusion that the current system, as constructed, could not "get there from here". His experience, wisdom, passion and support encouraged me- and countless others- to continue the search for transformational change; to understand and accept the democratic nature of community engagement, necessary to ignite and sustain the public will to accept and serve every learner. He will be missed. I got to know, respect, and love Ron Wolk through our shared passion for student-centered education reform and support for the inspiring work of Big Picture Learning. No one has been a more relentless advocate for new learning models, pathways, and institutional approaches to transforming student experience and outcomes. Ron was impatient with educators and administrators that resisted change. He was a pioneer at Education Week in opening up new communication and engagement channels and in shining a bright and honest spotlight on what worked and what didn't. We have all learned so much from Ron and now continue the education reform fight that he helped catalyze on behalf of students. 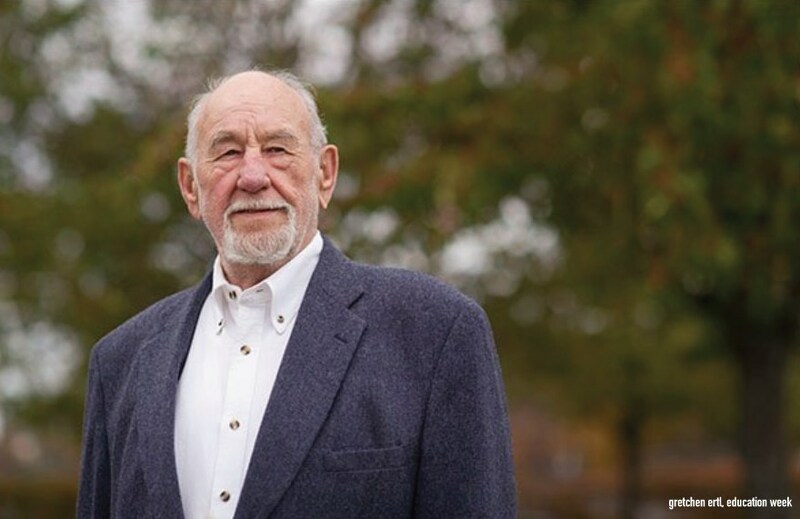 We truly stand on the shoulders of Ron Wolk, an education giant. So many of us will have Ron's voice in our heads forever reminding us of the urgency to get education right. Students are waiting. Rest-In-Peace Ron Wolk. We have designated a scholarship fund in honor of Ron's contributions to Big Picture Learning and the worlds of progressive education and journalism. To contribute, please visit this page and select the Ronald A. Wolk Scholarship Fund as the "special purpose" of your donation.